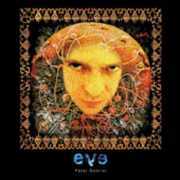 Eve is Peter Gabriel's second multimedia effort, a mixture of art and music within an interactive game where you try to change a surreal landscape into a paradise by clicking in the correct spots. The game's story involves Adam and Eve being separated in the Garden of Eden, and Pandora's Box has scattered objects across four game worlds which must be explored and various bits of video and music located to solve the riddle of "the Relationship between man, women and nature." The 4 worlds: Mud, the Garden, Profit and Paradise (plus Ruin, between Profit and Paradise) are represented by scrolling 360-degree panoramic scenes. The images of the worlds are made up of 120 screens assembled from 22,000 photographs, and each world features a Gabriel song and the artwork of one of four well-known fine artists, Nils-Udo, Yayoi Kusama, Cathy Monchaux, and Helen Chadwick, which gives each world its own unique look. The puzzles are intuitive, the player has to look around and click on stuff to see what happens. Buildings in each world, such as the Human Relations room and the art galleries, are common to each one and what you find will be determined by what you have interacted with in the scenes. The game has 80 minutes of video and 45 minutes of music to be discovered. Many of the interactions are keys to sound loops to collect for three separate IMX (Interactive Musical Xperiences) in EVE that strip down popular Gabriel tunes like "In Your Eyes," "Come Talk To Me" and "Shaking the Tree" to layers of tracks, riffs and dubs and let you goof around with reassembling them, recording your own mixes and translating them into animated videos. Background (or mood) music loops are like accompanying instruments, and flyins are the lead instruments or vocals. For each song there are 12 background loops and 18-21 flyins. Some are available by default, but many have to be found in the worlds of EVE.